Beautifully Illustrated, Humorous Coffee Table Book about Ireland and Irish History. Signed by author Conor Cunneen. Order your copy of For the Love of Being Irish and I will personally sign your book. Thanks for your purchase – Cheers! Order For the Love of Being Irish and I will personally sign your book. 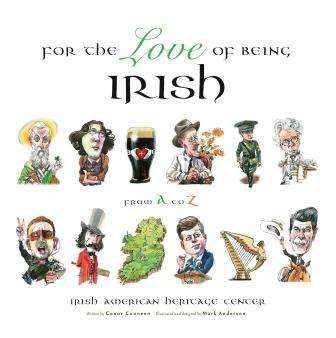 Written by Conor Cunneen and illustrated by Mark Anderson, For the Love of Being Irish features all the humor, passion and history of Ireland. Conor Cunneen provides history and personality of Ireland via limericks, well researched content and OK, maybe a touch of blarney which is then magnificently illustrated by Mark Anderson. Author Conor Cunneen is a Corkman happily exiled in Chicago, where he says the Guinness is drinkable, the natives are friendly and he has been force-fed more corned beef and green beer than he ever had in Ireland. Yes! Solve your Best Irish Books and Gifts for St. Patrick’s Day with a personally signed copy of For the Love of Being Irish.